"We are extremely excited to introduce the Marriott Hotels' 'Travel Brilliantly' ethos to a new destination. Indonesia is one of our fastest-growing source markets for both domestic and international travel and it is only fitting that the Yogyakarta Marriott Hotel is in such a historic and culturally significant destination," said Mike Fulkerson, Brand & Marketing, Vice President Asia-Pacific, Marriott International. 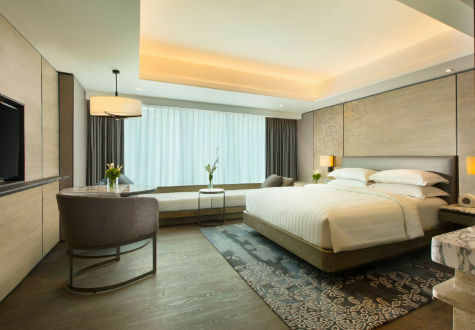 Yogyakarta Marriott Hotel is nestled in a strategic location where guests can easily immerse with local culture and explore the city's tourist destinations. The 18th-century historical Keraton Royal Palace and The Borobudur Temple, one of the world's largest Buddhist temple and a UNESCO World Heritage, is only an hour by car. All 347 guestrooms and suites are designed in the Marriott Modern style balancing utility with style and equipped with the latest technology and fast Wi-Fi connection for those who'd like to stay connected while on the road. To inspire a brilliant stay for guests, Yogyakarta Marriott Hotel houses a boardroom, seven meeting rooms and several pre-function areas to host various business meetings and intimate events. The 1,870-square-meter pillar-less ballroom is the largest in Yogyakarta, making it the grandest venue in town for special celebrations. "Yogyakarta Marriott Hotel is not only the newest hotel in the historic city, but is also leading the pack in terms of innovative meeting facilities for business travelers as well as easy access to all of the city's tourist attractions," said Alain Rigodin, General Manager, Yogyakarta Marriott Hotel. Yogyakarta Marriott Hotel offers a dynamic selection of delicious local and international food and drinks at three creative dining venues, complemented with Marriott's thoughtful service. The all-day dining Yogyakarta Kitchen boasts a modern design with an interactive open-kitchen buffet concept, while the Taman Sari Bar & Grill specialty restaurant is a fine choice to unwind with a view of the swimming pool. The Lounge on the lobby provides a convenient atmosphere for casual meetings and an inviting atmosphere to unwind with a cocktail in the evenings. Facilities are thoughtfully designed to create an excellent stay experience. Being the largest club lounge in town, the M-Club makes an exclusive place to indulge in some drinks over a small talk. The holistic sanctuary Quan Spa will pamper guests with selections of beauty rituals to align the body and mind and restore clarity, while the Exercise Room will keep everyone fit with cutting-edge workout machines. Guests can also simply plunge into the outdoor swimming pool to refresh and relax. A direct access to the largest shopping mall and entertainment in Central Java gives guests an easy access to taste the modern vibe of Yogyakarta city.